We all use the iTunes ‘app’ store, where we buy our iPad software. Now, Apple has introduced the “App Store“. It comes with the latest OS update, 10.6.6 but can also be installed by it’s self. If you have yet to look around, the new store is all Mac software. We started noticing titles right away that are on our iPads. Software titles that are the desktop/notebook equivalent of the iPad software… where you can create items on one device and share it with the other all within the software. No more need to convert files from one type of document on the iPad to another for a desktop app to use/edit, then back again when you want to return the file to your iPad. Most of these software titles aren’t new, they have been around as long as the iPad app, but now they are handy to get to when you need them. Searching with “iPad” doesn’t seem to bring up a list of software that we would expect, so the current path is to search for titles we have on our iPads. ToDo lists, project planning and keeping track of tasks – we have covered many tools in this area with different solutions, favored by individuals unique needs. 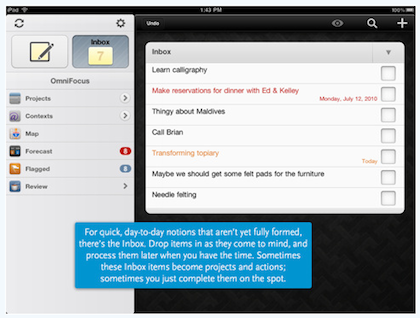 On the iPad, the Things app is a ‘super’ ToDo solution. This app is way beyond basic ToDo lists, it allows for many layers of sorting and ways of managing tasks. Basically creating ‘smart’ todo lists where you can have projects with their items sorted by what needs to be done today, tomorrow and onward. Lists can be synced to/from the Mac version of Things via a Wifi network. Currently, local network sync is the only connection between the iPad version and the desktop version. Another ‘top of mind’ solution we have on our iPad that we actually first used on the Mac desktop of OmniFocus. 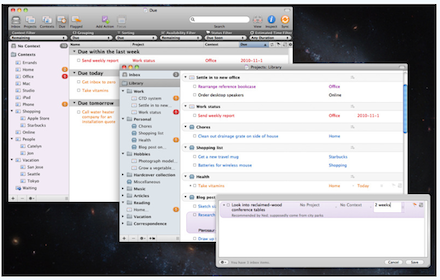 OmniFocus is one of the many offerings from The Omni Group. 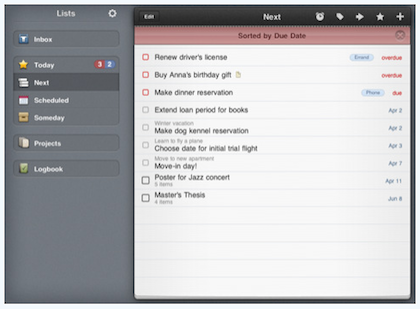 Like Things, OmniFocus offers the ability to take projects and divide them down into tasks and micro manage progress. The strengths of OmniFocus on the iPad is that you can have a list of ‘not yet assigned’ tasks that are thought of on the fly, then assign them to a project later. This is actually pretty handy in a brainstorm session where ideas are flying but you don’t know which will stick. Task can be broken into as much hierarchy as needed, with tasks and sub tasks. On the Mac software side, OmniFocus offers many ways to sync to the iPad; via your MobileMe account, a WebDAV account you may have or across the local Network using Bonjour. While very powerful, we do have two complaints – the iPad/Desktop software is both on the high end of expensive and drilling down and moving a task has to be done one at a time. That said, those that live by the app ever day don’t mind those items at all. 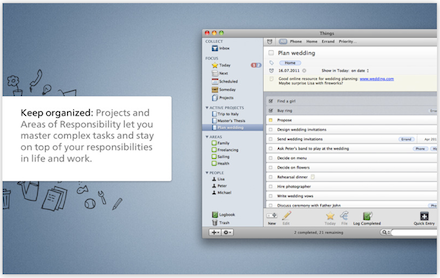 Getting away from the ToDo/Task managers, another often used group of apps is the MindMapping or brainstorming apps. We have yet to see a desktop for iThoughs in the new Apple App Store, but happily there is both the free and pro versions of MindNode. 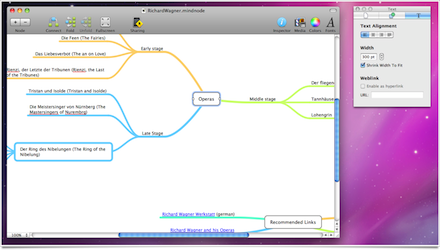 MindNode for the Mac comes in two versions, a free version and a Pro. Both versions can share files with your iPad, but the ‘Pro‘ MindNode has WiFi file transfer as well a very long list of other features (compare free/pro chart). 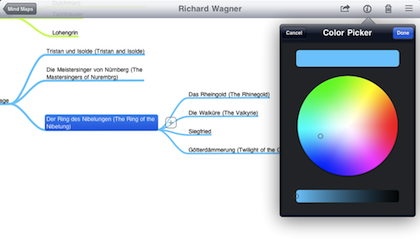 With MindNode on the iPad, create new or edit MindMaps from the desktop versions of the software. There is a lot to see in the Apple App Store. We can see it becoming a much faster way of finding the desktop mates to our iPad apps.